A sale is complete only after the customer pays. Yet in client places I have come across people in sales function act as if their sale is complete with the purchase order from the customer. This is a familiar situation in many companies. Many may think that it's got to do with the attitude, and they may be right. But it is also a fact that performance assessment systems and definition of roles have contributed to it. If you ask sales guys on how their incentive system is structured, chances that 9 out of 10 would say it is 'sales volume' is highly likely. Collections are always an afterthought in assessing a sales person's performance. Jobs performed, either directly or indirectly, generate revenue or focus on cost control. Revenue is generated only when your banker ticks up your bank balance and not when your customer signs the purchase order. It is important to assess sales performance in a balanced manner but receivables management is much more than that. SOP is initiated at the receipt of Customer purchase order and ends with the delivery of product or service to the customer. Every activity along the line must support speedy processing of work along with the required quality. Any activity that holds up the process even for a brief period must be thoroughly examined and its purpose validated. I have come across businesses where the quality of a order is checked by people in production function. This kind of activity is often referred to as a control activity, to ensure that the interests of the business do not suffer. But in reality these types of activities often hurt customer interests and cause resentment among sales ranks, which in turn affect business interests. It is the job of salesmen/women to ensure that the order they bring in matches with the quality expected by the business and its policies. The buck stops with them. Any order that they accept and receive must be processed without any hiccup or delay concerning the quality of the order. The interest of the business can be protected by making sure that the performance of the sales managers is evaluated based on the quality of orders that they bring in and not just by the volume of orders. 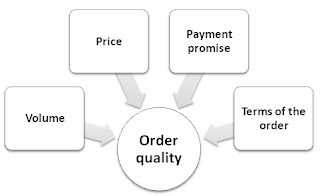 Evaluate the quality of an order based on the volume of the order, the price, payment promise and the terms of the order. There was an occasion when a company accepted a big order (around 150 pump sets) at Rs.1140 / unit. I was working on an assignment there and advised them against it since I had every reason and data to prove that it was not even covering their variable costs. It some how did not register in their minds and eventually they did sell at that price and recovered the payment after more than 3 months. It was a struggling company and execution of this order only added to their woes. 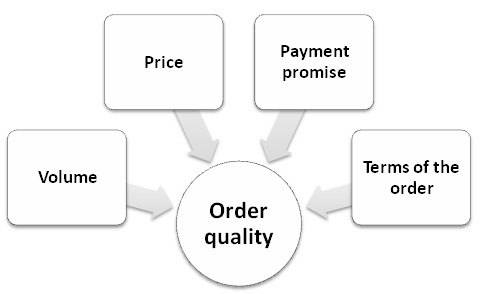 Payment promise is another aspect of a quality order. It refers to both the track record and the current expectation. It is difficult to validate it pre-sale, however a company must evolve a system whereby payment track record of customers is captured and linked to performance of respective sales people. Terms of sale refers to other things including delivery and any other offers and concessions. A sale that results in lesser net revenue for the company must get lesser performance rating compared to other normal sales. Assess the performance of sales managers and sales men based on the quality of orders they bring in. As long as their performance meets with the expectation on all the fronts, allow them a free hand in accepting orders of all quality. If the performance is not desirable then constrain them from accepting lower quality orders. Also link the incentive system to this performance rating. Rest assured your business interests would not be hurt by your sales men. No one would like their wings (freedom to accept orders) to be cut and not especially when their colleagues merrily flap around. Secondly incentives structured around proper sales performance would make them think twice before accepting an order. It's a well known aspect of receivables management. If you service bad, you would not get your payment in time. Don't mess up with any customer and definitely not with your regular customers. Give them what you promise and Promise what you can give. See related article keeping your customers. Your sales order processing is excellent, and your customer service is impeccable yet your receivables may get delayed because of customer financial troubles, bureaucratic customers and customers who want to delay for their own benefit. Develop a system and automate it to help speedier collection. With the help of technology capture information generated by the system (like customer feedbacks, dodgings, remarks and intelligence of people following up etc.). They help in understanding different customers, their ways and in evolving the follow-up system. In the long run patterns emerge and give better understanding of various things that delay collection and how to over come them. It is always important to know how profitable a customer is to a business and where he costs and where he benefits it. Comprehensive customer rating systems would help a company avoid and if necessary qualify customers at Pre-sale and treat them accordingly. By improving the quality of customers, a company can easily control the age of its receivables. More importantly link them all, SOP, Customer service, PFCIS, and Customer rating system.